Being a bit further from population centers, the Bush wasn’t nearly as crowded as Stratton last weekend, but things were still on the busy side. The only significant wait was for the Castle Rock chair (up to 25 minutes, but well worth it). Super Bravo had a 5 minute wait, most other lifts were ski-on. We split the weekend between Lincoln Peak (Saturday) and Mount Ellen (Sunday). A better strategy for crowd avoidance probably would have been to reverse that order, but in the end it really didn’t matter. Natural snow trails were skiing as good as it gets. Really, everything was skiing great. We usually head straight up to Heaven’s Gate, but instead warmed up for a few runs off the new Valley House quad, mixing things up between the beautiful hardwood glades and trails like Moonshine and Lixi’s Twist. Then it was over to Castle Rock for a run down Rumble (possibly our favorite trail at Sugarbush). The Rumble trees were so loaded with powder that we followed up with Bear Claw, an off-the-map line that drops down from the Long Trail. Another Castle Rock run and a Paradise finished up our afternoon. Never got to Stein’s, Ripcord or a few other favorites. They’ll still be skiing well when spring arrives. Sunday was the family’s first introduction to Mount Ellen, and it had been 15 or so years for me too. The difference between Lincoln Peak and Mount Ellen - aka Sugarbush North - is pretty striking. There's no fancy base village, no expense condos, just the 1970s era lodge that is somewhat reminiscent of the former Stateside Lodge up at Jay. It's like the anti-Sugarbush. Of course none of that stuff matters once you're up on the mountain because it's in the terrain department that North really delivers. Mount Ellen's got a nice selection of blue cruisers like Rim Run and Lookin' Good, but it's really known for its black diamond test pieces, in my opinion some of the best expert terrain in the east. Favorites for us on Sunday were Black Diamond Rush, Hammerhead, FIS and especially Exterminator, which we lapped 3 times. We skied some of the tree runs, on and off the map, but it's impossible to hit everything. We didn't come down off the upper mountain until the end of the day. 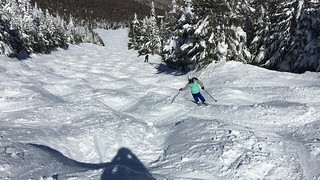 It may have been our best day of eastern skiing so far this season. We always have a great time skiing Sugarbush, but with conditions this good and a chance to explore North, this weekend was off the charts. It looks like our string of March storms is drawing to a close, but cold weather is forecast to persist into April. With all the snow we've gotten in the past few weeks, once things finally warm up we should be in for some epic spring skiing. Very minor point. Twist is known these days as Lixi's Twist, not Lexi's. Looks primo. Nothing beats Castle Rock!